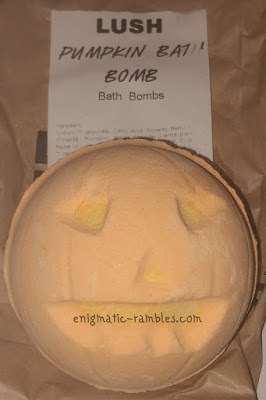 A few years ago Lush did bring out another pumpkin bath bomb, that one was flat and smelt different to this one. This new one is round and supposedly smells like pumpkin pie / pumpkin spice. To me this smelt of citrus; oranges and lemons at first which then lead on to a warm vanilla, hint of cinnamon, sweet pastry type of scent. I didn't find it smelt of pumpkin though which was a bit disappointing. The water turned a definite orange colour, which while is better than a yellow it is still a bit off putting. Afterwards I felt my skin was neither dried out nor moisturised, and the scent did linger on my skin for a couple of hours afterwards.